Ensure that the nodes have full hostname. Command to check hostname: "hostname -f"
Ensure that you have installed Java. Run command "yum install java-1.7.0-openjdk"
Database & Memory requirements - Ambari requires a relational database to store information about the cluster configuration and topology. 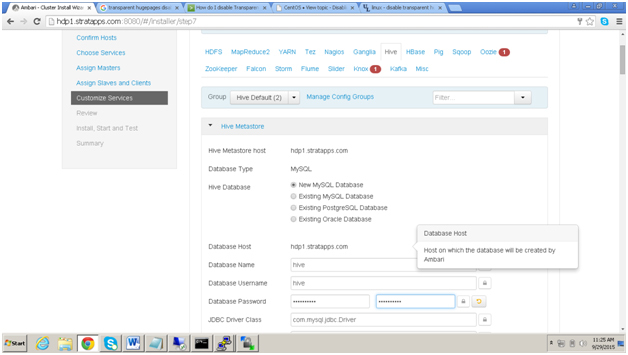 If you install HDP Stack with Hive or Oozie, they also require a relational database. Ambari : By default, install an instance of PostgreSQL on the Ambari Server host. 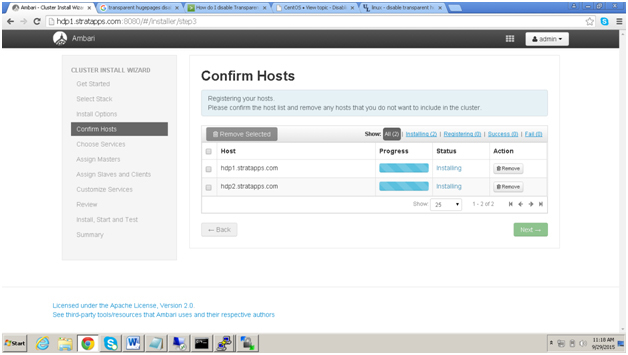 Hive : By default (on RHEL/CentOS/Oracle Linux 6), Ambari will install an instance of MySQL on the Hive Metastore host. Oozie : By default, Ambari will install an instance of Derby on the Oozie Server host You can also use existing instance of PostgreSQL, MySQL or Oracle. For the Ambari database, if you use an existing Oracle database, make sure the Oracle listener runs on a port other than 8080 to avoid conflict with the default Ambari port. Also ensure that you have atleast 8 GB of ram on each host. Apache recommends that you have atleast 1 GB of ram available. Configuring iptables:During cluster installation we need to ensure the connections are open between cluster hosts without any restrictions. In order to achieve that we need to Turn Off the IP tables (Firewall). Disable SELinux and PackageKit. Forthis the following file needs to be changed. 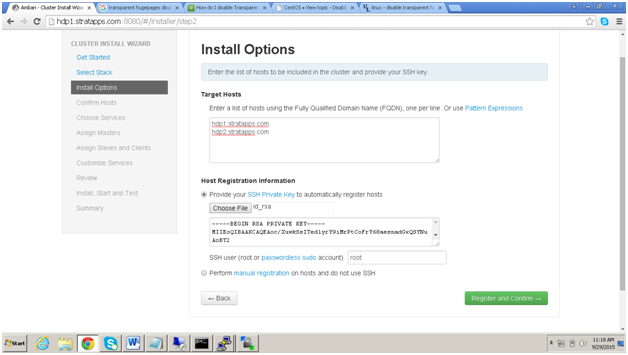 Ensure that the nodes have fully qualified domain name (full hostname). Use command "hostname -f" to check the full hostname or FQDN. Use the /etc/hosts file to add both the node hostnames. 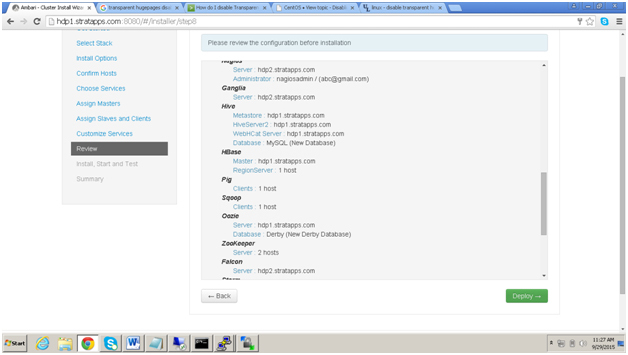 Follow the steps from step1 to step4 on Node2 i.e hdp2.stratapps.com as shown above. Once all the steps are completed. 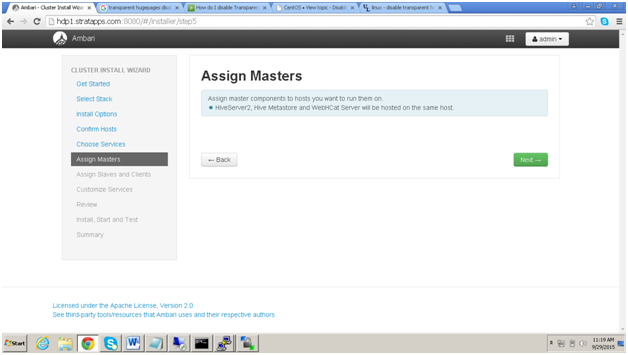 Ensure the communication happens between the nodes using the below command on both nodes and vice versa. Create password -less SSH. To have Ambari Server automatically install Ambari Agents on all your cluster hosts, you must set up password-less SSH connections between the Ambari Server host and all other hosts in the cluster. 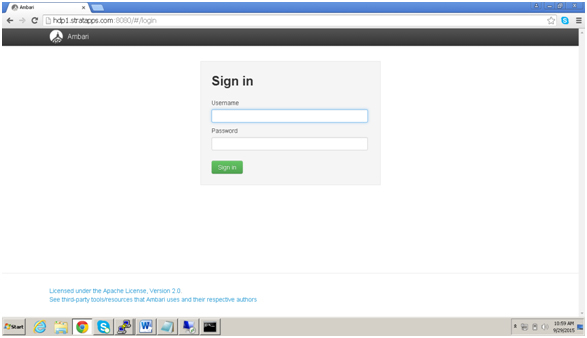 The Ambari Server host uses SSH public key authentication to remotely access and install the Ambari Agent. 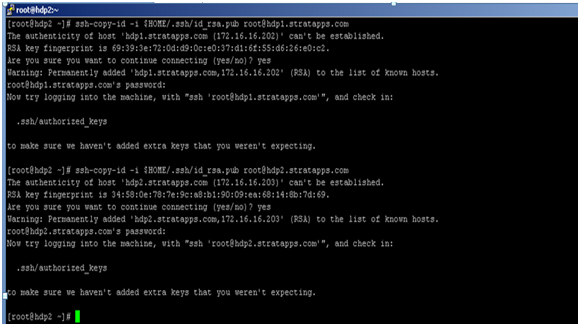 Copy the SSH Public Key(id_rsa.pub) to the root account on your target hosts. Need to test the ssh connection to the host without password. 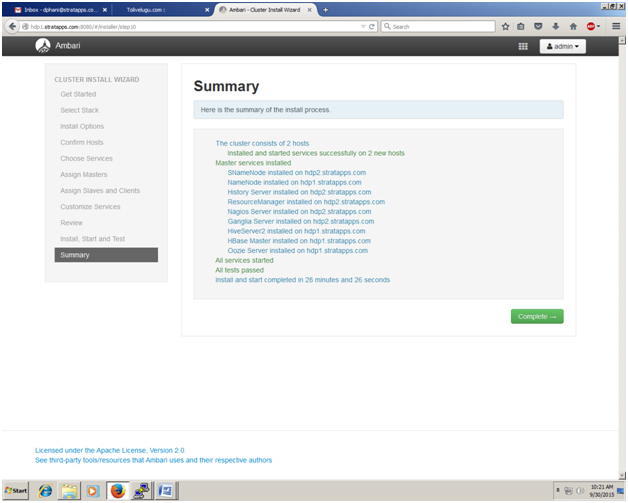 Http server is required for webbrowser access. Setting up a local repository: If your cluster is behind a firewall that prevents or limits Internet access, you can install Ambari and a Stack using local repositories else you can use internet to access Hortonwork repositories. Obtaining the Repositories: Ambari Repositories : If you do not have Internet access for setting up the Ambari repository, use the link appropriate for your OS family to download a tarball that contains the software. HDP Stack Repositories : If you do not have Internet access to set up the Stack repositories, use the link appropriate for your OS family to download a tarball that contains the HDP Stack version you plan to install. Once ambari is installed we need to run the setup using the command. Select a JDK version to download. Enter 1 to download Oracle JDK 1.7.By default, Ambari Server setup downloads and installs Oracle JDK1.7 by accompanying Java Cryptography Extension (JCE) Policy Files. 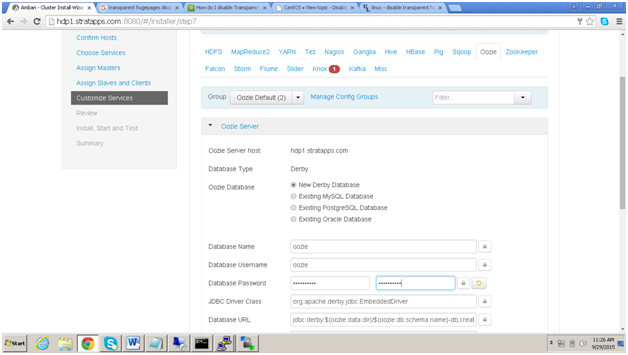 Select n at Enter advanced database configuration to use the default, embedded PostgreSQL database for Ambari. The default PostgreSQL database name is ambari. The default user name and password are ambari/bigdata. 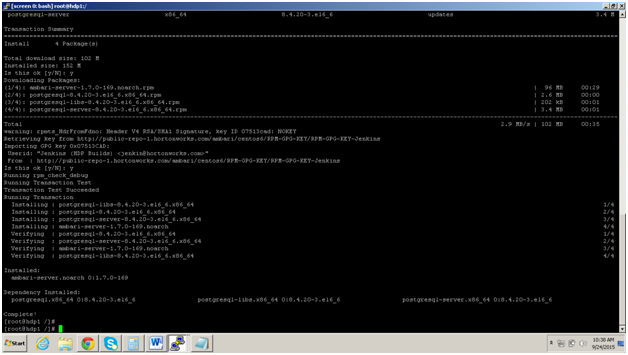 Else, to use an existing PostgreSQL, MySQL or Oracle database with Ambari, select y. 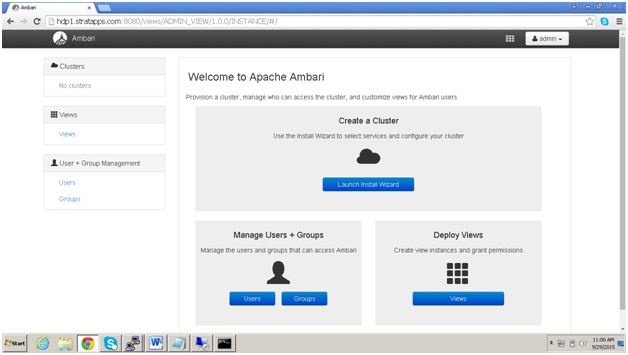 We will use the Ambari Install Wizard running in your browser to install, configure, and deploy our cluster. Log in to the Ambari Server using the default user name/password: admin/admin. You can change these credentials later. Step-11: From the Ambari Welcome page, choose Launch Install Wizard. 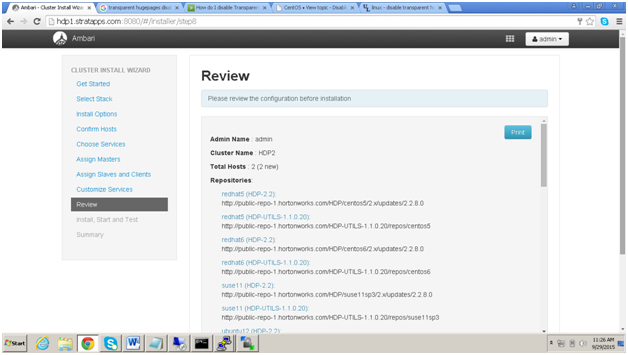 Then press “Launch Install Wizard” for creating new cluster. Give your own name for cluster and Press “Next”. 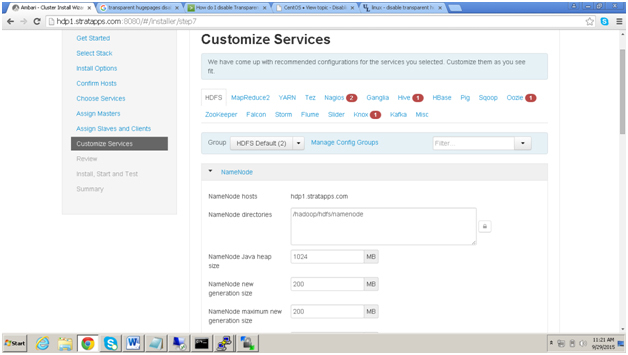 Step-13: The Service Stack (the Stack) is a coordinated and tested set of HDP components. Use a radio button to select the Stack version you want to install. 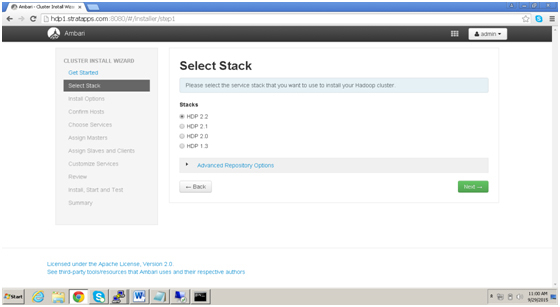 To install an HDP 2x stack, select the HDP 2.2, HDP 2.1, or HDP 2.0 radio button. 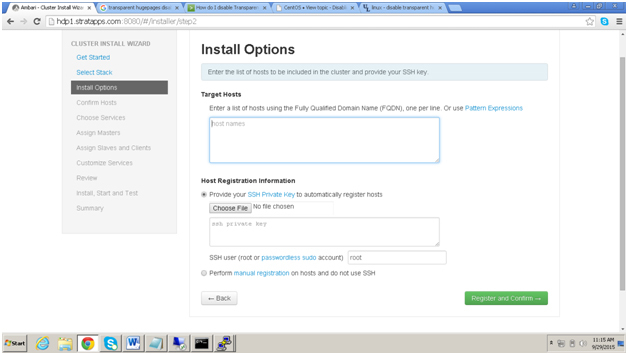 Step-14: Need to provide the fully qulaified domain host names here for cluster creation. We need to access the private key file created earlier between the hosts. For that first we need to open node1. 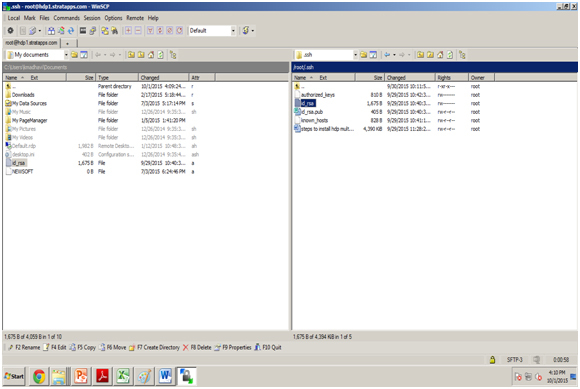 i.e hdp1.stratapps.com with winscp. Follow above screen. And then copy id_rsa file(private key) into your desktop. Find the above screen. 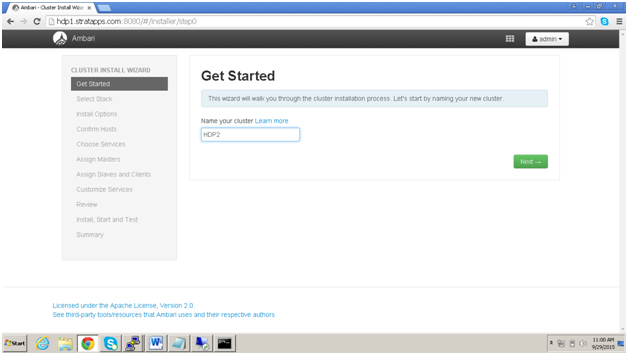 In order to build up the cluster, the install wizard prompts you for general information about how you want to set it up. You need to supply the FQDN of each of your hosts. The wizard also needs to access the private key file you created earlier. Using the host names and key file information, the wizard can locate, access, and interact securely with all hosts in the cluster. If you want to let Ambari automatically install the Ambari Agent on all your hosts using SSH, select Provide your SSH Private Key and either use the Choose File button in the Host Registration Information section to find the private key file that matches the public key you installed earlier on all your hosts or cut and paste the key into the text box manually. Then press “Register and Confirm”. 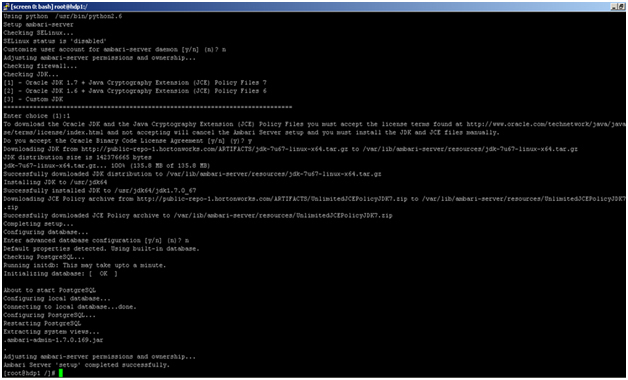 Here it will check ssh authentication with provided private key.Check above screen. 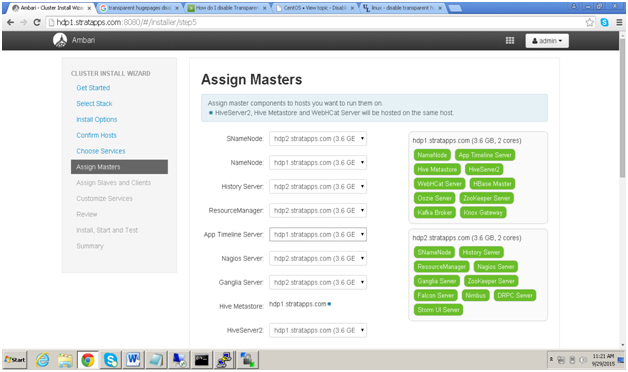 The Ambari install wizard assigns the master components for selected services to appropriate hosts in your cluster and displays the assignments in Assign Masters. 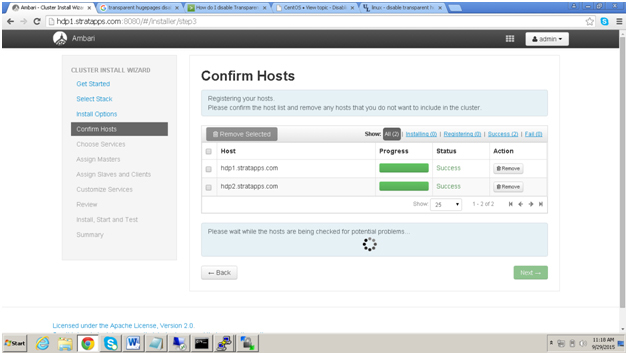 Hive server,Metastore Web Hcat should be Hosted in same machine. 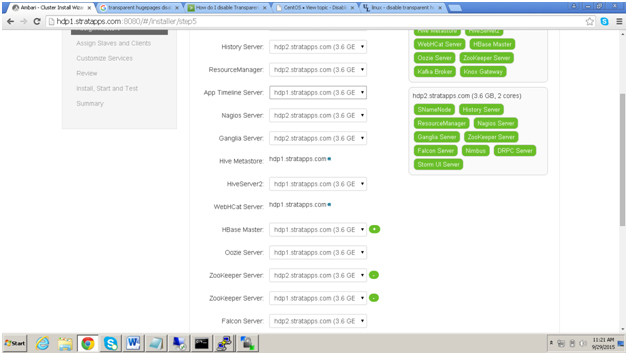 Here we hosted on node1 i.e hdp1.stratapps.com. The Ambari installation wizard assigns the slave components (DataNodes, NodeManagers, and RegionServers) to appropriate hosts in your cluster. It also attempts to select hosts for installing the appropriate set of clients. 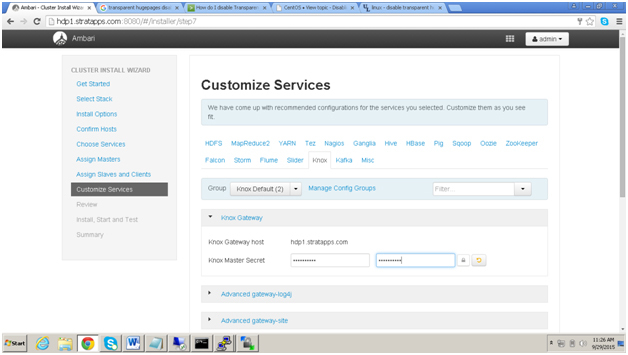 Customize Services, here we need to provide usernames and passwords in the required fields. 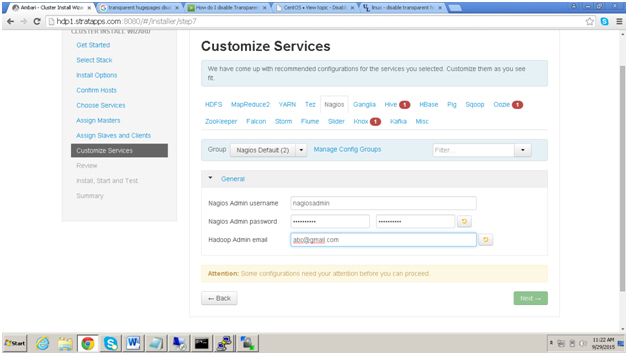 Here we need to provide password and mail ID for nagios service. Review all the settings and services before starting the installation. 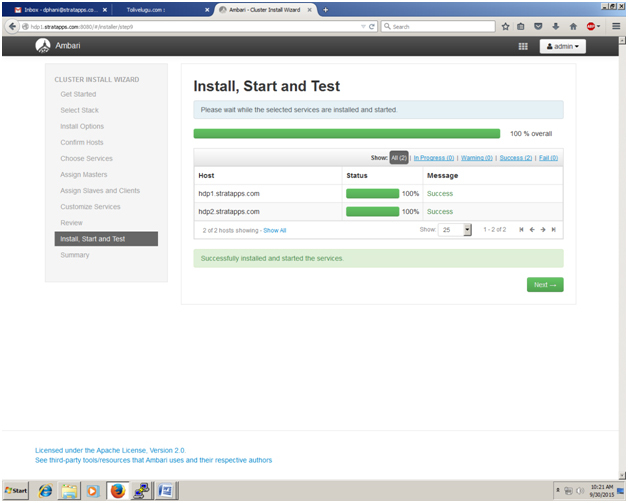 Start the installation by clicking the Deploy button. 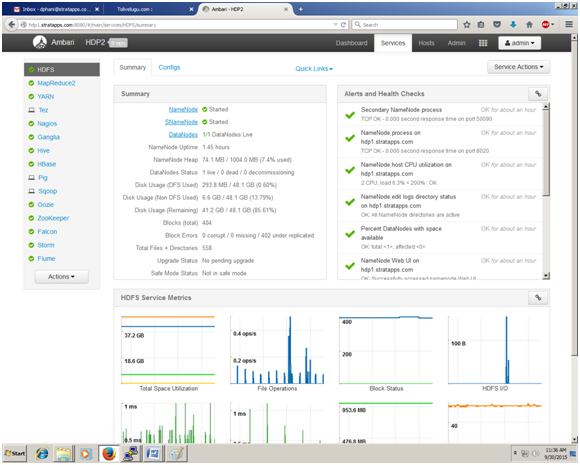 Here, the dashboard shows that all services are up and runing. 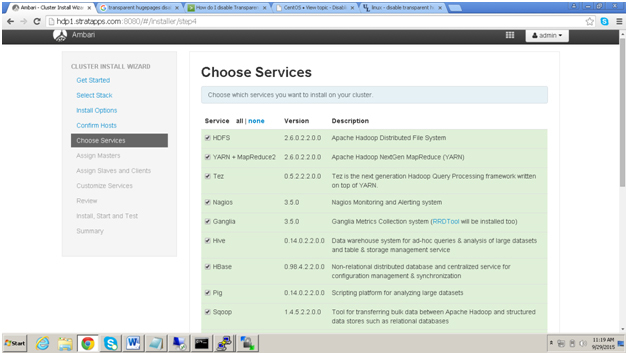 This completes our Hadoop Server Cluster deployment. 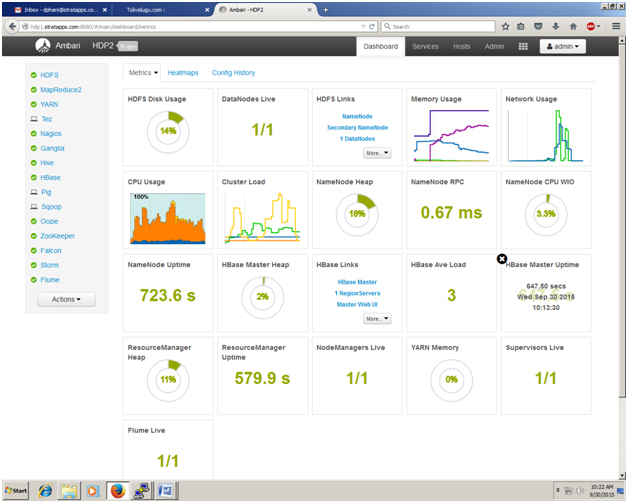 In single node hdp installation, we have all hadoop daemons on single node with separate jvms. When comes to the multinode hadoop installation all hadoop daemonsare sharedon multiple nodes.For example here we have 2 nodes, in this two nodes we had shared hadoop daemons based on our hardware requirements.